Max Seibald (42), who made a good impression in his Cannons debut, carries the ball agains the Outlaws’ Noah Molnar. 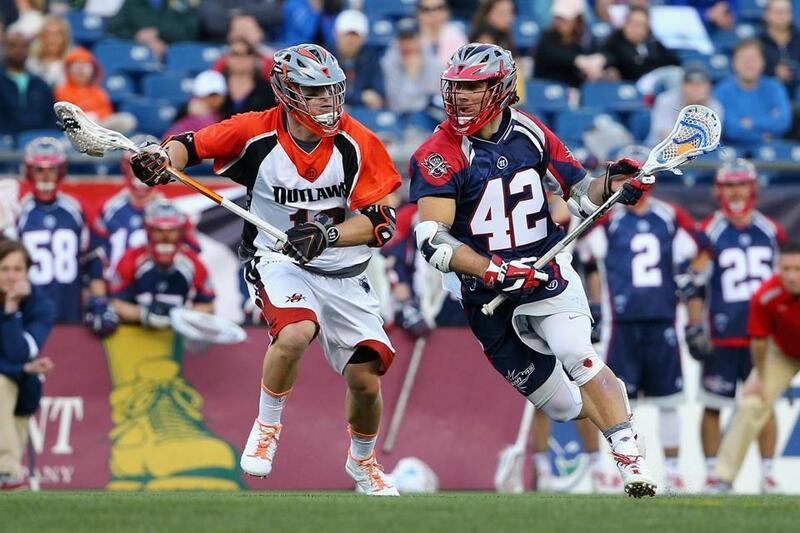 FOXBOROUGH — In January, the Boston Cannons traded away midfielder Paul Rabil, a two-time league Most Valuable Player. On the eve of the team’s 15th anniversary season, the prevailing question surrounded Boston’s offense, and who would rise up and lead when needed. At Sunday’s home opener at Gillette Stadium, the answer proved to be the man for whom Rabil was traded. The Cannons gutted out a 16-13 decision over the Denver Outlaws, the defending MLL champions, Sunday afternoon before a home crowd of 4,285. Max Seibald, the main chip the Cannons received by parting with Rabil, finished with a hat trick in his debut, including a pair of insurance goals inside the final five minutes after the Outlaws had whittled a six-goal deficit to one. The speed and physicality of the young Cannons flustered the defending champs for the better part of three quarters, but the talent that carried Denver to last season’s title began to emerge late in the third quarter. Facing a 12-6 deficit, Denver’s Justin Pennington and Drew Snider combined for five of the ensuing six goals. Only Martin Bowes could find the back of the net for Boston, the Outlaws drawing within one midway through the fourth. That’s when the veteran Seibald effectively snuffed Denver’s momentum in the span of two minutes. He first beat his defender to the edge and rifled a shot through the alley that eluded the basket of Jesse Schwartzman (13 saves). Next time down the field, he muscled his defender off his position as they raced around the net, changed direction, and went high on Schwartzman as the Cannons held a three-goal lead with 2:48 remaining. Seven Cannons found the back of the net. Will Manny, Boston’s leading scorer from a year ago (52 points), capped the Cannons’ scoring with his second of the game. The Cannons held an 8-5 lead at the break, a first-half hat trick from Denver’s Chris Bocklet keeping things close. Boston would go on to surrender the first goal of the second half, but wasted little time compounding theirits lead. Within the span of 20 seconds, Rob Emery and Josh Amidon beat Schwartzman with a pair of 2-point goals, the Cannon lead swelling to 12-6 midway through the third. The Cannons accrued only two 2-point goals all of last season. Andrew MacDougall can be reached at andrew.macdougall@globe.com. Follow him on Twitter @Andy_MacDougall.